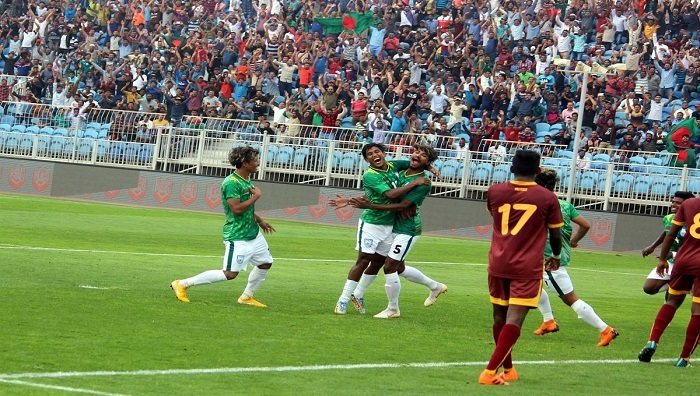 Bangladesh U-23 team tasted the maiden victory in the 13th match of the AFC U-23 Championship Qualifiers beating Sri Lanka by 2-0 goals in the last Group B match at the Khalifa Sports City Stadium in Isa Town, Bahrain on Tuesday evening. Bangladesh Youth team made their early exit from the AFC U-23 Championship after suffering 2nd consecutive defeat against stronger Palestine and hosts Bahrain by 0-1 each goal in their Group B encounters and remained at the 3rd slot in the four-team group. Islanders Sri Lanka finished bottom empty-handed after suffering two humiliating 0-9 each goals defeat against Palestine and Bahrain.